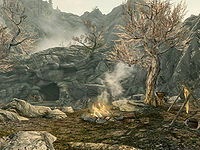 Red Eagle Redoubt is a small cave and two exterior camps, one small and one sprawling, all occupied by Forsworn located east of Markarth. The map location is near the highest point of this small range; just southwest of Sundered Towers which lies at the peak. The surrounding area is populated by a large number of Forsworn of increasing skill as the player approaches the peak, which itself is home to several elk. Rebel's Cairn: Find Red Eagle's sword. Two leveled Forsworn guard the approach from the northwest. One of them is next to a campfire, with an iron ore vein and a rack for drying hides nearby. The second Forsworn is on top of a rock with a small wooden table and chair and wooden steps up to it. The entrance to Red Eagle Ascent is to the left of this raised area. This cave is a typical Forsworn encampment with the normal sharpened stakes and goat head decorations as well as vegetation throughout. Upon entering there is a tunnel that twists and turns, until you pass a tree stump with a patch of mora tapinella growing from it, here it opens out. There is an elk head off to the left with a lit lantern in front of it, next to this is a deer hide. Just after this, on your right is an iron ore vein behind some of the sharpened stakes, next to a tree with a couple of taproot ornaments. Across the path by this is a tripwire that drops an oil lantern on an oil slick trap. Setting this off will alert the two Forsworn that are guarding this part of the cave and can be used to your advantage in dealing with them. Behind the previously mentioned tree is a small coin purse on the ground. 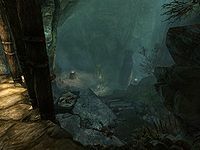 Near where the two Forsworn are stood is a lit brazier with a random healing potion next to it and an adept-locked chest behind some roots on the opposite side of a tunnel entrance heading east. Through the tunnel there are fly amanita and several white cap fungi before climbing a flight of stone steps up to the next cavern. There is a bear trap just after entering this cavern, hidden among some of the vegetation. Three more Forsworn make this room their home, the first is at the top of another flight of stone stairs and the other two are at the rear of the room. Before reaching the stairs you pass another white cap patch on your right and just before the stairs there is a burial urn on your left. At the top of the flight of stone stairs is a pressure plate that activate poison darts fired from your right across the path in front of you and on your left a handle that can be used by the Forsworn to activate a falling boulders trap below. Off on your left behind a tall piller is a lit brazier with a random battleaxe and helmet laying beside it. Following the path up over a few wide steps you reach an area with a blood covered altar holding a leveled bow, random potion of magicka and decapitated skeever. Also on this plateau is a chair and flight of wooden stair with an unlocked chest and random stamina potion underneath. The stairs lead up to a corridor that branches of to your right to the exit, and ahead to blocked corridor with a fly amanita, two bleeding crowns, a blisterwort fungi and a medium coin purse. Taking the branch to the right and up a few more steps you reach an unlocked iron door that leads out to Red Eagle Redoubt. Upon exiting you are at the bottom of several flights of stairs up. There is a campfire with a pile of firewood behind. Each flight of stairs has Forsworn guarding them each increasing in skill as you go higher. Before climbing if you travel around to the left of the first flight of stairs, underneath a fallen stone tower you will find a large coin purse. At the top of the first flight of stairs there is a Forsworn either wandering or sat on a wooden bench. Taking this one out can alert the Forsworn at the top of the next flight. Before climbing again, at the top of the first flight turn right and come back on yourself to find a novice-locked chest. Climb the third flight and start the next flight, now there are three Forsworn two at the top of the fourth flight and one above you to your right on higher ground. It is possible to take out the first two without the third finding you if your sneak is high enough. The one above you is always an archer. Ahead are more steps passing under three arches. Growing from the second of these is a hanging moss plant. As you pass under the third there is a small Forsworn camp on your left with two open tents and two long wooden tables and benches between them. There is a Forsworn sat at the tables and a second sat in a chair in the farthest tent. Too much noise taking these out can alert a Forsworn wizard from a tent further behind on the next plateau up. Inside both tents is a single hay pile with a barrel in the first and the chair the Forsworn was sat on in the second. Back on the path you pass a stone pillar and a lit brazier on a stand on your left. Here the camp splits with a single tent with the wizard on your left and the main part of the camp to your right. Inside the tent with the wizard is an unowned single bed, an alchemy lab, a barrel with a leveled dagger on top and random boots beside it. The main camp consists of four tents around a campfire with a blacksmiths forge beside the nearest tent. Between the nearest tent and forge is an adept-locked chest. Three Forsworn are guarding this area one sleeping in the nearest tent, one wandering or sat on a wooden bench and the third behind on a raised area. On top of the anvil, part of the forge is a steel mace. Each of the tents contains a hay pile, with the first also containing a wooden bench, the next two also containing chairs and the last also containing a dresser. There is also a wooden table with a mead barrel and sack on top and several other sacks and wooden benches around the camp. To the right of the last tent is a wood chopping block. The path continues heading east towards Sundered Tower and the boss of this redoubt along with one other Forsworn and another raised area reached via stone stairs. Before that traveling south down the side of one of the tents you'll reach a melee practice area including two dummies and a wooden table holding a random greatsword. On your left before reaching the stairs up to the boss is an archery practice area including two archery targets and a wooden table holding a random bow. Climbing the stone stairs you'll encounter the last Forsworn before the boss, and pass a wooden flight of stairs up to Sundered Tower, with a tree stump with a mora tapinella growth on the left of these stairs. Ahead the Forsworn boss will be sat on a throne or if alerted searching for you near an altar. The boss will have Red Eagle's Fury. Past the throne and altar are a few steps down to another tent containing an unowned single bed, a boss leveled chest, a chair and wooden table holding a mead barrel, copy of The Legend of Red Eagle, a leveled stamina potion, a random shield and lit lantern. This chest will hold any item that you have been sent to Red Eagle Redoubt to find. One silver ore vein is located 120 ft east of the entrance, slightly uphill. Looking at the world map when inside the Red Eagle Ascent places your marker north-northwest of Markarth. If you have previously killed the leader of the Red Eagle Redoubt and get the task to kill him again you must reanimate the body and kill him a second time. You may get this task while trying to purchase a house in Markarth from the Jarl. The book Red Eagle's Rite on the altar might clip beneath the surface, making it unreachable without the console. This page was last modified on 17 April 2019, at 23:49.